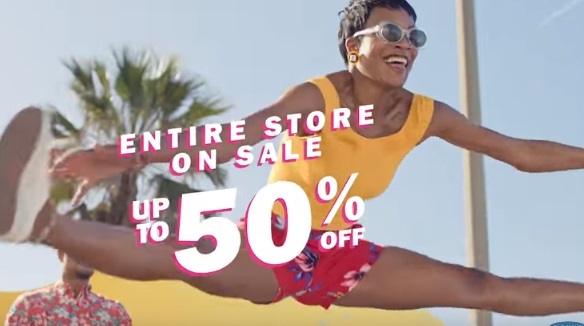 Old Navy advertises its summer sale in a new ad, encouraging people to jump into summer with Old Navy and highlighting that now there’s up to 50% off the entire store. The 30-second commercial opens with a family of four at the seaside, noticing a group of youngsters playing with a jump rope. The father joins the girl skipping rope, showing off his amazing skills. As the spot goes on, it turns out there are several other persons, including kids, all wearing Old Navy colorful outfits, jumping ropes and having fun. Serving as the perfect soundtrack is the 2018 single “My Happy Feet” by Ruth Anne Drown. Among the pieces featured in the ad are the Fit & Flare Tiered Cami Dress for women in yellow floral, the Off-the-Shoulder Linen-Blend Shift Dress for Women in Lost at Sea Navy, with all-over gingham print, and many others for men and kids, as well. The clothing and accessories retailer invites people to “Jump into summer with up to 50% off the entire store,” with styles from $5.